Bhuvanesh Komkali on living up to the legacy of his grandfather Kumar Gandharva and where it is taking him. Bhuvanesh Komkali at the Delhi Classical Music Festival. A few hours before his performance at the seventh edition of the recently-concluded Delhi Classical Music Festival, Bhuvanesh Komkali looks nervous, listening to a bandish on his iPod, rehearsing, fidgeting. The grandson of Kumar Gandharva, the genius with the unconventional, high-pitched voice and the son of Mukul Shivputra, who could stir thousands with an alaap, Komkali, 36, is aware of the legacy he has inherited. “My audience mostly comprises staunch Kumar Gandharva fans. The start of the concert is a nerve racking moment. The solution is to surrender to the moment and just perform,” says Komakali. On stage, Komkali’s gayaki is intense as he sings in raag Bihag, but it is shorn of complicated taans. The texture of his voice is similar to his father’s and the technique of stirring up a fresh combination of notes every now and then is reminiscent of Gandharva. As the bhajan progresses, he gains momentum and delivers a sound performance. With the Karnataka government conferring the Mallikarjun Mansur Memorial Award (2010), in recognition for his talent, and the Sangeet Natak Akademi awarding him the Bismillah Khan Yuva Puraskar in 2012, Komkali is slowly but surely notching up accolades with every performance. “His is a compassionate new voice in the often difficult classical music world. 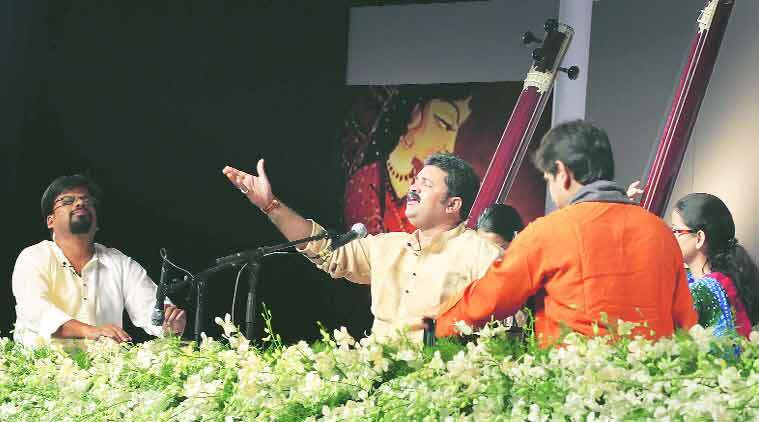 He is quite good now and in another decade, he will be brilliant,” says Pune-based vocalist Pandit Satyasheel Deshpande. Growing up in a family of musicians in Dewas, Madhya Pradesh, Komkali recalls his grandfather sitting and practising all day, coaxing the young boy to sing. Even as a child, he was mesmerised. Gandharva interpreted music by taking the best from every gharana and putting it together in a single bandish. This was a radical break from the prevailing order of contemporary musicians such as Moghubai Kudrikar (Kishori Amonkar’s mother) and Mallikarjun Mansur, who revelled in the sophistication of a khayal singer. A purist’s nightmare, Gandharva decided to break away from the upper-class moorings of classical music. “He managed to reach the soul of people, especially with those beautiful Nirgun bhajans. I follow what he did. Will I innovate, break away from the existing teachings? I don’t know yet,” says Komkali. He openly acknowledges Gandharva for shaping his gayaki but refrains from saying much about his father. The journey from his childhood and his recent ascent to fame has been rocky and devoid of engagement with Shivputra, Gandharva’s son from his first wife Bhanumati. Known to be a mad virtuoso and an organiser’s nightmare, Shivputra turned to alcohol right after Komkali’s mother died during childbirth. Komkali travelled, now and then, like a nomad with Shivputra, who went on to live in an ashram on the banks of the Narmada. After Gandharva’s death in 1992, the maestro’s second wife, vocalist Vasundhara Komkali, stepped in and brought the 14-year-old boy back to the ancestral home. There, she began training him. “My grandfather’s presence in my formative years equipped me with a strong base. I also learned much from his recordings. But Vasundharaji has taught me everything I know. She helped me get used to the idea of being a musician,” says Komkali, who also spent a long time training under vocalist Madhup Mudgal to understand the inflections of the male voice. In 2000, he made his debut with neither his grandfather nor his father by his side. However, the performance at Shanamukhananda Hall in Mumbai announced the arrival of a unique talent. “The sanskaar (culture) of an artiste is very important and Bhuvanesh has got Kumarji’s sanskaar,” says Deshpande. In the last few years, Komkali has performed at reputed music festivals in India, including the Sawai Gandharva Music Festival (the brainchild of Pandit Bhimsen Joshi), and The Dover Lane Music Conference. His soundtrack for the 2002 Hindi feature Devi Ahilya was much appreciated. When he is not recording or performing all over the country, Komkali is archiving and digitising his grandfather’s recordings. He is also teaching a handful of students in Dewas and keeping with tradition, Komkali’s four-year-old son is one of his students as well. Before every performance, Komkali recalls his grandfather’s advice to him. “He always said that one’s voice is an expression of one’s soul. If you extend it to the simplest of the compositions, it isn’t hard to reach the divine. I’m prepared for that. If I find my own path, I would have done my job,” he says.